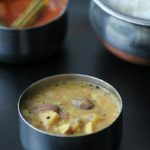 If you are looking for more South Indian Recipes then do check Vazhaithandu Poriyal, Vazhakkai Podimas, Keerai Sambar, Mango Sambar, Kathirikai Sambar, Onion Kuzhambu, Mulai Keerai Kootu and Sweet Potato Kuzhambu. 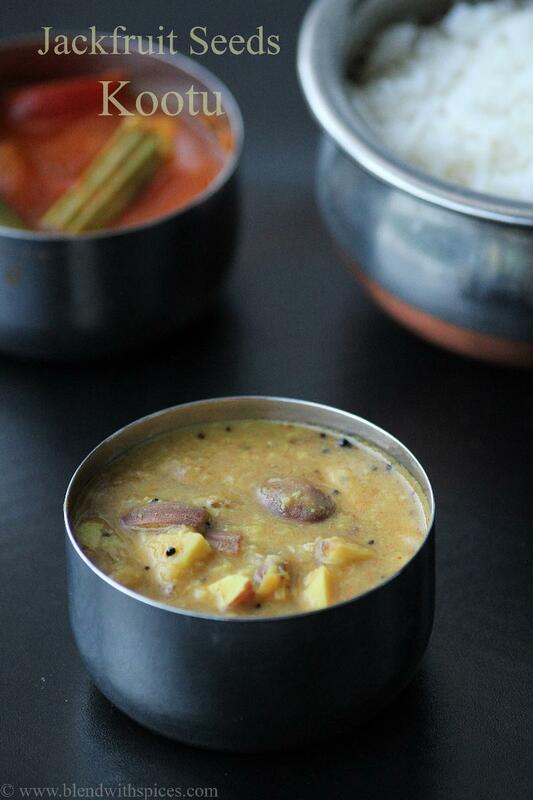 A traditional South Indian side dish made with jack fruit seeds, lentils, spices and coconut. Tastes great with rice. Pressure cook the moong dal with water for 3 whistles. Soak tamarind in water for 15 minutes and squeeze the extract out of it. Keep it aside. Cut the jackfruit into 2 pieces and remove the white skin around it. Wash the peeled seeds and chop into small pieces. Soak them in water to prevent discoloration. Add chopped seeds, salt, turmeric powder and water in a vessel and let it cook until the pieces are tender. Meanwhile, grind the chopped onion, coconut and cumin seeds to a little coarse paste using little water. Set aside. Add the tamarind extract, sambar powder, cooked moong dal and ground coconut paste to the cooked jackfruit seeds and mix. Add water to adjust the consistency of the kootu. Adjust the salt and let it cook for 6 – 8 minutes. Heat oil in a pan for seasoning. Add the mustard seeds and urad dal and let them splutter. Add the hing and curry leaves and stir for few seconds. Add this to the prepared kootu and combine.